When speaking about the practice of chöd, ‘cutting through’ or ‘cutting off,’ I have to give the complete picture since only one aspect of the entire practice (for instance, meditating and playing the big drum) will not help you understand the meaning and purpose of cutting through. First it is necessary to know the source of the chöd teachings. The great Indian Bodhisattva Padampa Sangye, who lived in the 11 th-12 th century, is the principal teacher and therefore the father of the Shije Lineage. Many historical texts mention that his other name was Kamalashila, so they were closely connected. Padampa Sangye brought Shije to Tibet and described it in the title of the ritual text he composed, which is Dam-chös-dug-näl-zhi-byed-byed-pa- The Profound Dharma that Pacifies Suffering. He visited Tibet five times, entering from a different direction on each visit (from the area that is now Afghanistan/Pakistan, from India, from Nepal, and so forth). Padampa Sangye transmitted this lineage to many great male and female practitioners who became accomplished masters - 54 in all. He did not invent Shije but based it on the Sutras and Tantras. In the main text of Shije, the Dam-chös-dug-näl-zhi-byed-byed-pa, he compiled the topics on pacification that he found scattered in the Sutras and Tantras and that were initially imparted by Lord Buddha. The school has completely disappeared, though the practice of chöd has survived. To illustrate what it means to condense a vast body of teachings so concisely, the larger version of the Prajnaparamitasutra consists of 100,000 slokas (each sloka or verse having four sentences), the middle-length version consists of 25,000 slokas, another version consists of 18,000 slokas, and a shorter version is written in 8,000 verses. The Heart Sutra is the very short version of the Prajanaparamitasutra. There are many other Mahayana teachings on insight into emptiness, which are all associated with the Second Turning of the Wheel of Dharma. The Prajnaparamitasutra is the source for the Dam-chös-dug-näl-zhi-byed-byed-pa - The Profound Dharma that Pacifies Suffering. This applies to the great tantric text Chu-rin-chen-po-rgyüd, too. The Chu-rin-chen-po-rgyüd- The Precious and Great Stream of Tantra explains how the Sanskrit language arose from nothing. This treatise expounds that the sound that arises from nothing is AH. And the sound that arises from nothing is the source of all sounds that can be made by animate beings and inanimate things, i.e., every sound that can be made or that can arise is based upon AH. If it is missing, no sound can follow. The Precious and Great Stream of Tantra describes ultimate nothingness of vowels and consonants that can be investigated through linguistics. AH is the expression of nothingness when it becomes manifest as sound. In the same manner, all Tantras that deal with Mahamudra are the principal source of Shije. After having briefly contemplated the sources of the sacred Shije Lineage, it is important to respect and honour the great masters who have handed down the instructions to us and then to study its aspects. General Shije is taught on an intellectual and experiential level through shes-pa-instructions and sgrub-pa-transmissions. Shes means ‘can be known, knowledge, recognition, intelligence, to be aware of, to master, wisdom-awareness, prajna in Sanskrit.’ sGrub means ‘to acquire, to obtain, to work for, to practice, to proceed and accomplish, to fulfil, establish, finish, complete.’ Secret instructions are also given, but only if a disciple is receptive and ready. Even if a teacher tries to instruct a student who isn’t ready, or even if a student who isn’t ready tries to be instructed, or even if a teacher tricks a disciple to instruct another follower, or even if a student tricks a teacher to receive the teachings, it won’t work. A disciple needs to be ready in order to be a worthy recipient of the secret instructions. So, there are three types of instructions, shes, sgrub, and gsangs, ‘intellectual instructions, practice instructions, and secret instructions. 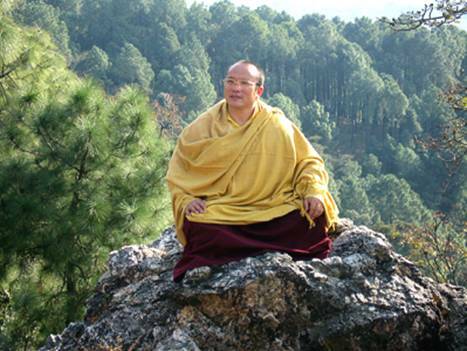 The sacred lineage is passed on through these three methods, as in all Vajrayana lineages. The Shije Lineage was held by 25 great masters. One master was called Crazy Jokro - his surname was Jokro, his real name was Mr. Crazy. There is nothing great about being crazy, but I think he must have been crazy in the right way, i.e., properly crazy. There were 24 women and a few more who developed perfect realization, upholding and transmitting the precious Shije Lineage to their disciples. You will remember that chöd belongs to the Shije Tradition that was brought to Tibet by Padampa Sangye. He passed on the sacred teachings to one of his most devoted female disciples, Machig Labji Drönma, Ma-gchig Lab-sGrön in Tibetan. Ma-gchig means ‘only mother,’ Lab is the name of the town of her birth in Tibet, and sgron means ‘lamp, lantern.’ So her name is Only Mother Lamp. Both Lord Buddha as well as Guru Rinpoche, Padmasambhava, prophesied in Sutras and Tantras that Prajnaparamita, the Great Mother of Emptiness, would be born inseparably united with Tara, the Great Mother of Compassion. Machig Labdrön is the 107 th incarnation of Prajnaparamita inseparably united with Arya Tara. I don’t know how this is counted unless Prajnaparamita and Arya Tara always incarnated at the same time. Maybe they lived a long time ago, died, and were reborn, etc. in a conventional manner. In any case, in the rDo-tang-nyik-byed-pa-Sutra it is mentioned that tang and nyik will become inseparable, tang meaning ‘tea’ and nyik meaning ‘leaves.’ The name of this Sutra is not Tea Strainer but refers to the process. In this Sutra, Lord Buddha prophesied, “When mankind is in great need in future times, the Mother of the Glorious Ones will incarnate in a place called Lab in the north. Her name will be Drönma and she will benefit innumerable living beings through the generation and completion phases of visualization practice. She will wander in towns and cemeteries.” The description “Mother of the Glorious Ones” refers to Prajnaparamita and Tara since both wisdom as well as compassion give birth to ultimate awakening, which is enlightenment. Machig Labji Drönma (who was born in 1055 C.E.) was recognized as the person referred to in this prophecy - her name was Drönma, the place of her birth was Lab, and she wandered in towns and cemeteries while practicing generation and completion phases of meditation. They are quite advanced practices. In the Tantra called ‘Jam-dpäl-rtsa-ba’i-rgyüd - The Manjushri Root Tantra, Lord Buddha prophesied: “When my teachings become like a tealeaf, the Great Mother will be born and her name will be Labdrön. Her activities will be very far-reaching. Anyone who has anything to do with her will be liberated.” In the Tantra called Tenpa-spyir-lung- The General Prophecy in Buddha’s Teachings, Guru Rinpoche stated, “An incarnation called Labji Drönma will practice in the district of Zangs-ri and cut through all negative thoughts, uprooting them completely. She will cut discursiveness off so finely that negative thoughts will be without roots and will never arise again.” Zangs-ri, the ‘ Copper Coloured Mountain,’ is a specific site in Tibet associated with Machig Labdrön. After having practiced and perfectly realized the chöd teachings, Machig Labdrön transmitted the instructions in a slightly altered form. For example, she taught (1) chöd to develop and increase wisdom and compassion, (2) chöd to heal someone who is sick, and (3) chöd to purify an environment of negative influences and forces, for example a haunted house. The last type of chöd can falsely be seen as something like exorcism, which does sound a little frightening. Chöd is a gentle approach and improves a particular environment peacefully. What really happens when a place seems haunted or someone seems possessed? This points to a negative connection between the person and the spirit or ghost that is haunting a house or a place. When a negative force in a certain place possesses someone, something terrible may have occurred there. It is important to understand that not everyone who is crazy is possessed, although a few who are very negative are. If so, it points to a negative connection between the victim, who is a human being, and another sentient being, which is neither a human being nor an animal, rather is a spirit, ghost, demon, or whatever. When friends have a good connection, they help each other. For instance, if person A is better off than person B, then A will help B and we call that being a good friend. If A, who is strong but negative, gets together with B, who is weak, then A influences and changes B. Then both are negative and we say that A is a bad friend. In the same way, when a person unconsciously develops a connection to a spirit, it can be good or bad. If the spirit is negative, then the person connected with that spirit will become negative. If they are connected to each other quite closely, that person can even lose his or her own will to the influence and control of the bad spirit for a certain period of time. The same principle applies to an environment or house. A strong and good person wants to experience a good spirit in his or her environment and house. If a house, for example, stands under the influence of a negative spirit who is animus towards the inhabitant, the house will be experienced as negative. How can the one be separated from the other? Of course, there is a negative way to deal with this, which I interpret as exorcism. But there is also a gentle way, which is to tame and pacify the spirit. Why is there a frustrating and painful connection between persons and places to begin with? Suffering that arises from negative causes and conditions is always felt and experienced in one way or another. By practicing the third type of chöd, which is purifying an environment of negative influences and forces, harmful spirits residing there become positive. Whatever caused suffering that drives spirits or ghosts to be revengeful and to inflict frustration and pain on others is pacified through the practice of chöd. The practice of chöd purifies negative relationships between persons and places. Machig Labdrön’s realization of chöd is exceptional and very precious, the reason why Tibetan scholars and masters honour and revere her so highly and fervently practice chöd that she received from Padampa Sangye and explained so concisely. Now you understand the source of the chöd teachings, the original lineage called “Shije Mother Lineage” that branched into the Chöd Lineage. The practice of chöd embraces all aspects of Tibetan Buddhism, even if this does not seem evident. Chöd is deeply related with Theravada and Mahayana and is founded upon these very sincere schools of practice. To clarify this point: An adept must have developed mindfulness and awareness of body, speech, and mind to a noteworthy extent, thereby having paved the ground in order to proceed and practice chöd. This is very important. It would not be right to simply think that someone who is a chöd practitioner need not be mindful or aware. It would not be right to think that just because the name of a great lineage-holder was Mr. Crazy, anyone who has received chöd instructions may act crazy, by carrying a skull cup, blowing a trumpet, and wandering around the country unkempt and sloppy. 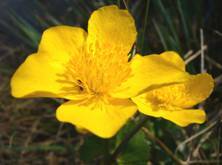 Developing mindfulness and awareness is the ground upon which an earnest practitioner walks. Actions that are based upon mindfulness and awareness come first and have to do with the outer aspect of practice. The inner aspect of chöd can be compared with contents in a container, the outer container being a practitioner who is doing what is possible to perfect mindfulness and awareness as well as to develop and increase his or her sincere intention. Actions are outer resources; intentions are contents inside a container. Good intentions make an action more valid, more real. A tantric practitioner of chöd should also have taken and uphold the basic tantric samayas, ‘the precepts and pledges to attain awakening for the sole benefit of others.’ It is not possible to practice chöd without having taken the vows and without having received the transmission. It is impossible to become a chöd practitioner by merely reading a book about it. If one thinks it is okay to practice chöd without having received the transmission, then there is the great possibility of getting everything wrong. The invaluable transmission supports benevolent behaviour and intentions. Practice is up to the disciple and, due to having received transmission, anything that he or she does not manage to perfect is not a mistake but is understood as something that has not yet been perfected. Without the transmission, though, thinking one can practice chöd is a big mistake. So, the Theravada level of practice (that is part and parcel of chöd) is outer discipline. The Mahayana level of practice (that is part and parcel of chöd) is inner discipline. The tantric level of practice (that is part and parcel of chöd) is having samaya and transmission. Samaya is deep devotion and unremitting commitment and is the core of the entire practice - it makes things happen and guarantees that things work. A chöd practitioner needs to integrate all three levels right from the start, which improve and grow through practice. And the improvements do lead to unification of wisdom and compassion. 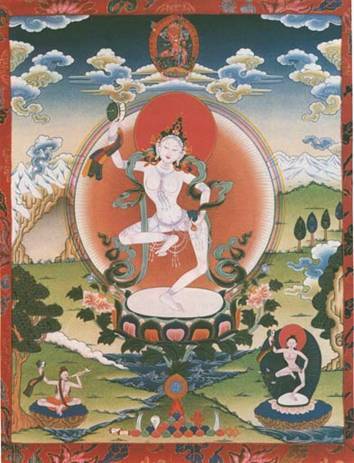 Machig Labdrön is the source of chöd practice. She is the manifestation of Prajnaparamita, the Great Mother who gives birth to realization of emptiness. Furthermore, Machig Labdrön is also the manifestation of Arya Tara, the Great Mother who gives birth to compassion. A chöd practitioner can cut through anything and therefore his or her main intention should be to unify understanding of emptiness and loving kindness and compassion, just as Machig Labdrön did. Now, when engaging in chöd, it is very important not to get stuck in the rhythm that is created when playing the drum and blowing the impressive trumpet. It is a bit of an enchanting and mysterious practice, you know, practicing after it gets dark and in cemeteries. It offers a chance to be different. But that is not the purpose. It is an extremely effective method to realize the inseparability of emptiness and compassion. Without an understanding of the sincere intention to attain this unity, then it can seem funny or eccentric. That’s not good. I think such interpretations are not good at all, even if some people think they are good. How can one understand realization of the unity of emptiness and compassion, stong-dang- snying-rje’i-zung-‘jug in Tibetan? sTong means ‘emptiness,’ snying-rje means ‘compassion,’ zung-‘jug means ‘together.’ sTong and snying-rje are like two strings – if you tie them together, they become inseparable, i.e., understanding emptiness and having compassion are tied together through practice. This is the aim of chöd, actually of every Vajrayana practice, but specifically of chöd. Emptiness is a valid topic of investigation; it is not that hard to understand and prove but it is unreasonable to simply reiterate that “Nothing exists. Everything is like a reflection of the moon on water” - which is true. But if you only have that understanding, then you become quite a strange person. You think that you have become impeccable when you are dead-set on your knowledge. You think you are more than impeccable. What can that be? Understanding emptiness is not enough – it’s only one side of the story. It’s like trying to clap with only one hand. You cannot clap your hands without having two hands. sNying-rje , ‘compassion,’ is a good thing to have. We feel sorry for someone who has nothing. We feel sorry for someone who doesn’t understand what we understand. We feel sorry for someone who finds something too complicating that we think is simple. Just like in the case of stong, if we only have snying-rje, it’s not enough – it’s only one side of the story. You may be a nice person, but you may turn into a quite pushy nice person for others very soon. Then you become an irritating person, because you but into everybody else’s business. When an understanding of emptiness and compassion are tied together, both shortcomings are solved and the situation becomes healthy. In that case, you have compassion, but at the same time you know that everything is empty; you know that everything is empty, but at the same time you have compassion. And just that is the purpose of practicing Buddhism, especially Vajrayana. The ultimate and relative truths are taught again and again in Vajrayana - until the teachings are carved in your skull. The truth of emptiness and compassion must go together so that your understanding of emptiness will not become a stubborn, philosophical, pig-headed condition; and so that your compassion does not become an obsession. In Vajrayana, the relative and absolute truths are taught so that your life becomes balanced, so that your compassion and understanding of emptiness will be more effective. By integrating stong-dang- snying-rje , ‘emptiness and compassion,’ you will become a fair and just person who has a big mind and not a big head on a big body. Your life becomes complete. If someone wants to practice chöd in a most powerful place, he or she must be aware of the fact that many things happen there; and in such situations it is not that easy to remain balanced. When unexpected things happen to someone, it seems natural to solve any problems if one has an understanding of emptiness and has compassion. If something powerful happens in a powerful place and in a powerful moment, an understanding of emptiness and compassion will enable a practitioner to handle the situation easefully. If one does not have enough compassion and understanding of emptiness, then it would be better to practice the simplified version of chöd instead of the advanced version during the daytime and at home. One may not be able to handle the advanced practice, so practicing in the afternoon is okay. So far I have not heard about a chöd practitioner who has gone crazy, but I can imagine that if someone does the wrong thing in the wrong place or even if someone does the wrong thing in the right place, something can go wrong. I see that it is very fashionable to be drunk, drugged, crazy, stupid, careless, and wild and that it is considered shameful to be gentle and generous in modern society, too. I see more and more of this happening myself. When I look at the lives of the majority of people and outside the community of dedicated Dharma practitioners, it becomes evident that Padampa Sangye’s words describe our society too. It is obvious that it has become shameful to be gentle and kind, that it has become fashionable to be aggressive and sly. I think that our teachers may be saying the same things to us quite often. The connotation of the word ‘progress’ is to cut through limitations and attachment, otherwise one stands still. So, any beneficial progress can be seen as a practice of cutting through. In chöd, the process is exaggerated slightly in order to emphasize and stress cutting through. There are three ways to cut through as taught in chöd. They are the external, the internal, and the sacred ways. (1) Externally, there are many things that prevent us from developing, i.e., something out there distracts and overwhelms one’s mind so strongly that one is obscured from doing what needs to be done in order to progress and become a better human being. Basic Buddhist instructions say that being aggressive and sly in order to dissever a connection intensifies it negatively. By practicing chöd, though, causes and conditions which link are transformed positively. One may succeed very fast, if not, then slowly and gradually. In any case, chöd is an extremely reliable technique to skillfully overcome negative connections that were made in the past without perpetuating more negativity. They cannot be overcome by rejecting or denying them nor through wishful thinking. (2) Internally, there are many obstacles, too. Outer obstacles are more obvious than inner ones. What is apprehended (outer) is connected with the apprehender (inner). Acknowledging and appreciating the fact that one is not the embodiment of inner obstacles but the embodiment of enlightened wisdom is the antidote against inner obstacles. Not recognizing one’s true nature that is free of obstacles impedes this recognition, so the amount and intensity of obstacles point to the degree of non-recognition one has. Again, chöd is the fastest method to skillfully recognize inner delusions without aggravating and perpetuating more negative feelings that turn into a third obstacle, if they are not pacified beforehand. (3) The sacred aspect of chöd addresses the very topic that ultimately there are no obstacles and relatively there are. There is the danger that the third aspect can turn into a new and major obstacle. Again, chöd is the most reliable method to skillfully cut through the first two without creating a third. How is this done? By applying the outstanding gesture of speech and speaking the syllable PETH. The syllable PETH has no meaning. It is not a word used in any spoken language, so when it is spoken or shouted, the sound alone cuts through – at least for the moment. Since it has no meaning like other words one knows and might say, for instance the words “yes” or “no,” the sound cuts through the raw situation of that moment, leaving space to experience a short retreat into what is actually present. Afterwards, relative reality takes over again and one has returned to the world of obstacles and delusions. The outer, inner, and sacred practices are always a part of every chöd practice, but one first starts by severing the outer, continues by severing the inner, and finally practices the sacred aspect of chöd. It is the only way to go. For instance, if one wants to get to the attic of a house, one must pass through the entrance and climb the staircase. That is how meditation practices function, too. Every further practice is based upon the preceding, like the rungs of a ladder, and the three ways are always practiced in one sitting. Now I would like to share a few sequences practiced in chöd with you. One particular practice of chöd involves four steps. They are known as (1) the mind that is like a canvas of the entire universe, i.e., the ground; (2) the power of the chöd transmission, i.e., the blessing; (3) the specific method to cut through the raw material; and (4) the first three in one. We wish to pinpoint our thoughts, for example when we say “green sweater,” “brown trousers,” “black shoes” – all these things are forms. We make gestures when we identify and distinguish forms, sounds, and other sensory perceptions that we perceive, and these gestures connect the one with the other and are made through the process of communication. Thoughts connect perceptions and experiences through movements. Having been asked to speak about chöd, one corner of my mind tells me to speak about chöd, while another corner of my mind looks into the subject by remembering books that I once read or by seeing the white paper and black letters inside those books. At the same time, another corner of my mind recollects sounds heard long ago. Some of these noise-makers are still alive in my mind; some are not as alive anymore but remain in my mind. There are lots and lots of forms that make lots and lots of sounds that turn into lots and lots of thoughts that are gathered together right now. Not only are all apperceptions bundled in thoughts, they are also gathered in front of you, in the form of the person you see seated on this cushion, who happens to be me. The chain-reaction continues when I think, “My form … Your form … All of you.” Then I make a sound of my thoughts in order to communicate with you, and during the whole process I am connecting with you. That is a short outline of what happens. What does the concept “the ground” mean? It is the mandala, which means ‘center and surrounding.’ Every single center has a surrounding. Every single surrounding has a center. So, every single thing in the universe is a mandala of the mind. Every form, every sound, every thought is a mandala of the mind. Mind is the center, thoughts and sounds are the surroundings of the mind - and that is the ground. (2) The power of the chöd transmission - the blessing - transforms the mandala of the mind from worse to better, from negative to positive, from unhealthy to healthy, from relative to ultimate. A disciple can become better, i.e., can transform through the powerful method endowed by means of the chöd transmission that an authentic lineage-holder imparts. It is a very effective blessing. How does the transformation take place? It is not the case that negative and positive things are placed inside a disciple from the outside, rather negativity manifests positively through the power of the blessings. Now, the essence of negative things is positive, the essence of unhealthiness is health; the essence of the relative is the ultimate. It’s not the case that the relative comes from the outside and enters the inside of a student nor that the ultimate is brought from somewhere, rather relative appearances and experiences are the actual manifestations of the ultimate. The ultimate is the center, the relative is the surrounding. This is one way of describing the most excellent and profound instructions of the Chöd Lineage. (3) A specific method to cut through what is called “raw material” is to understand that form (our body), sounds (our speech), and thoughts are all part of the mind. On a very subtle level, thoughts and mind are different. The mind can be compared with the ocean, thoughts with the ocean’s waves. The entire ocean is not the waves, while each wave is part of the vast and deep ocean. Similarly, thoughts are the waves of the mind. The specific method of chöd deals with body, speech, and mind. How is the body treated properly in chöd practice? Sitting straight and respecting one’s body. Speech, the other aspect, is related to the breath, to what is spoken, to chanting, to how closely PETH is connected with the mind when it is spoken. The first thing a chöd practitioner needs to consider is the sequence of meditation practice, which involves much visualization. One would think that cutting through involves less visualization, but there are many. Most visualizations in chöd are quite physical. But there are not only physical visualizations above and in front since one’s own body is engaged intensively while practicing. For example, in a specific chöd practice, one cuts up one’s body and feeds it to all those one is negatively connected with through the law of karma; one pays back one’s debts to one’s enemies by giving them one’s flesh and blood. Who is an enemy? Anyone who wishes to harm. If an enemy is really violent and evil, he or she will even want to kill the person they hate the most. When such a most unvirtuous act has been completed, that evil enemy may even be happy and think, “Now I have beaten my foe and am rid of that person.” This is not true, though, but that is what some people think. When dealing with negative connections, nothing is more valuable and decisive than one’s body, speech, and thoughts. This is why chöd teaches how to give one’s own flesh and blood to negative energies one is indebted to because of a karmic link. It sounds like a rather extreme and frightening method, but those who have received the transmission understand and know that it is a very effective way of dealing with negativities and these practitioners certainly value its worth. (4) Practicing all methods in one means preparing the ground by understanding (i.e., the preparation, the understanding), receiving the transmission (i.e., the blessing), and working with the raw material (i.e., with body, speech, and thoughts). All methods of practice only pertain to relative reality. A chöd practitioner has learned not to see any aspect of relative existence as an ultimate truth. Aware of these facts, he or she is able to cut through the belief in the method itself, i.e., he or she will not cling to any concepts regarding a subject, objects, and actions, in this case actions referring to the practice of chöd. To illustrate this, let me quote a verse that either Tilopa or Naropa sang in a song of realization: “Water can wash away stains, but water cannot wash water itself.” Similarly, chöd can cut through all obstacles, including the idea of practicing. Machig Labdrön then told her son, “Where is the best place? Not clinging to a place or location is the best place.” It is true, any place is okay. Any place is the best place if one is not attached nor clings to it. And then geomancy is not needed. That is why the greatest yogi, Jetsün Milarepa, was able to live in such uninhabitable places, in caves high up in the mountains, in places where no single flower could possibly grow, where a kitchen garden could not be tended, nor chickens could ever be kept. The places he chose to meditate were totally useless spots. From among the many reasons he had for meditating in such unfriendly and unfortified places, I think one may have been so that he would not become attached. The mother then told her boy about the best view and said, “The best view is not being attached to your view.” It is very important for a chöd practitioner not to be attached to a particular view. That is the best view – not being attached. There is a risk about sharing these teachings with you, especially about not being attached to a view, seeing that it may lead you to overestimate yourselves. Let me explain why: It is true that one should not be attached or cling to a view, but at this point in life, this teaching should only be kept in the back of your head and only remembered when you become overly attached to a view. It is important to have some kind of view, a principle to go by, otherwise one will go astray. Without a view, one will most likely get lost. Even if the view one has is not the best and one thinks, “Best view is no view,” it is still necessary to have a view to go by and therefore to hold on to it before trying to live according to what is called “beyond view.” Therefore, do not take my words about the view to heart right now and do not get carried away by the wonderful, ultimate advice that Machig Labdrön gave to her son. We are dealing with a deeper level of relative truth here, therefore it’s very important to be inspired by these teachings, while maintaining and increasing benevolent intentions and a wholesome lifestyle. All of these instructions are practiced according to one’s capabilities, according to the level of understanding one has attained, while one is aware of who one ultimately is and how things should ultimately be. So don’t get confused about these two levels of understanding. If you don’t want to be confused, it’s quite easy. If you decide to be confused, it’s difficult not to be confused. So, this is one specific set of chöd instructions that have been handed down to us in an unbroken lineage due to Machig Labdrön’s inconceivable wisdom and immense generosity. Normally, we are very closed down, both mentally and physically. So the purpose of opening the gate is to become free of restrictions and receptive for what takes place in the vast expanse of limitless space. If the door of a small room where someone has been trapped for many years is suddenly opened and this person is finally free to walk out, he or she experiences a lot of room, a lot of space. How is this practiced in meditation? Chöd uses sounds, visualizations, and physical posture so that a practitioner is able to develop strong reflexive awareness in the center of his or her body. The center of the body is very important. If my right hand were chopped off, I would still be alive. If the center of my body were chopped off, I would be finished. The center of the body is like the trunk of a tree. It is the center of the energy-source from which the mind functions. From the moment of conception until death, we function from this center. Many texts explain the channels that branch out into the body, so you don’t have to guess. Everything is taught in chöd. One’s entire energy, which is the embodiment of the mind and is situated in the central channel, is brought down to the lower part of the central channel while seated in the physical posture. One chants the recitations and practices a particular breathing technique. The energy is gradually released to the chakras, which are main points at the navel, heart, throat, and crown of the head and are in the central channel. A practitioner’s attention passes through each main chakra and then leaves the body through the crown of the head, the highest point in the body and the spot a king and queen honour by wearing a crown. It is the most important part of the body. The small aperture at the top of the head is called “the Brahma aperture” or “the heavenly gate.” The mind is released into the sky through the Brahma aperture and melts into space – but properly. This particular method is not short and one needs to have received transmission and instructions in order to practice it.The practice I am speaking about belongs to the aspect of inner development of the Six Yogas of Naropa.There are many other practices that are done in order to benefit others and are directed towards doing something “out there” in contrast to only developing “in here.” The practices done specifically for others can be called “offering and generosity,” which are practices very much related to devotion and compassion. There are a few things that people need to consider in order to develop and mature spiritually, even when engaging in any enterprise, actually. Many people are overly ambitious, get carried away, don’t accomplish what they wanted to do, and get into trouble instead. Others are able to carry out their plans and accomplish their aims. Of course, karma is involved, but technically speaking there are four principles involved if one wishes to succeed in anything one plans. They are devotion, which is offering up and not down, generosity and compassion that are directed downwards. And all the while the person carrying out his or her plans is in the middle while developing the qualities of devotion, compassion, offering, and generosity. Before one starts doing anything, one needs to know what one really wants to do. One also needs to be honest with oneself and know who one is and what one is capable of doing. When one has considered these three criteria (knowing exactly what one wants to do, knowing exactly who one is, and knowing exactly what one is capable of doing), then one works it out and gets things done. When these three points are missing, then one doesn’t know what one wants, one doesn’t know who one is, and one doesn’t know what one can really do. In between, confusion and all kinds of trips get in the way, boosting the ego to arrogantly think one can do something while one doesn’t even know what it is. The same can happen with one’s compassion and devotion. One doesn’t know how to be compassionate, is bewildered, and asks, “How to have compassion? For whom? How to have devotion? For whom?” The answer is quite simple: One should have devotion for those who have more devotion and compassion than oneself. One should have compassion for those who have less compassion and devotion than oneself. That’s it. In chöd practice, one’s attention is directed towards all sentient beings and all enlightened ones, who are not ordinary in the ordinary sense. Once upon a time they were ordinary individuals but not anymore – they are now enlightened. There are four types of beings one needs to consider and address when developing devotion, showing respect, and being compassionate. They are (1) those worthy of one’s devotion by making offerings, (2) those worthy of respect by making offerings, (3) those deserving compassion by being generous towards them, and (4) those with whom one is connected with due to negative karma by being generous towards them, too. In the chöd tradition, the four recipients one keeps in mind are called “four guests.” One imagines organizing a big feast and intends inviting the four kinds of guests. They are the Three Jewels, the Buddha and bodhisattvas who elicit faith and devotion, the protectors of the Dharma, who are endowed with excellent qualities and elicit respect, sentient beings who are in need of our compassion, and negative harmful spirits, to whom we still need to repay karmic debts. Let me speak about the fourth kind of guests one invites to the feast one is preparing, because they are those one is karmically linked with most strongly. One owes them something and they owe one something. How is such a strong karmic connection explained in Buddhism? And so, having invited guests to the feast one is about to give, preparations need to be made. Usually, chöd practitioners cannot afford elaborate offerings to give to their guests and therefore they arrange a symbolic feast, very much like Catholics who offer a little piece of bread to eat and a little drop of wine to drink. We call such an event “an imagined feast.” The text recommends three kinds of offerings: vegetarian, non-vegetarian, and material goods. Vegetarian meals are served to all sentient beings, not only to monkeys and rabbits. Non-vegetarian dishes are served to all guests, not only to tigers and leopards. Sometimes bears eat meat, sometimes only vegetables, so one gives them what they want. And then one imagines all material goods that every living being would enjoy and thinks one is giving these things to them, too. One does not give these things meaninglessly and neurotically; rather they are first blessed by engaging in the proper ritual, by chanting the prayers and giving rise to benevolent thoughts. These thoughts are powerful, because they are enforced by the transmission lineage. Whatever one visualizes in the chöd offering is blessed and therefore it is a powerful present and not just a piece of bread or ordinary jewellery, clothes, etc. When everything is collected and beautifully arranged, one asks one’s guests to please come. First one invokes the Three Jewels, the Buddha, Dharma, Sangha, Guru, deities, and protectors. Then one invokes those beings that are worthy of deep respect, like the gods of the universe, gods of mountains, rivers and oceans, gods of men, gods of women, gods of children, gods of education, etc. Everyone has an own spirit and we call it “a shoulder god,” because it sits on one’s right shoulder. If one takes good care of it, then everything goes well. If one does not take good care of it, then one’s shoulder god leaves. When it is gone, you go down. Many unfortunate things happen to people who don’t take good care of their shoulder god. It is not a punishment; rather it is more like being thirsty. If there is no water, fish cannot survive. If one has no self-respect, one’s shoulder god cannot stay. Then that person becomes someone who is deprived of divine force. Shoulder gods cannot give more than they have. They cannot give us enlightenment, but they can give us protection, they can make us healthy, they can help us in many ways – but they can’t give us enlightenment. Shoulder gods are objects of respect, not of devotion. Then one calls all sentient beings that are in need of compassion to please come. Actually, nobody is in need of compassion since all living beings have Buddha nature. But there is many a one who does not recognize this and therefore suffers in samsara. No matter who they are, no matter in which position or situation, they suffer very much because they do not recognize their true nature, so one has compassion for them. Finally, one asks all those beings one is karmically connected with from recent lives, including those one is connected with negatively, to please come to the wonderful feast. One owes them something or they owe one something. It doesn’t matter which way around, one is strongly connected with each other, and the result of that connection has still not been resolved – not yet. So, one has compassion for them and is about to spoil them more than abundantly. Whatever offerings and beautiful presents can be made are perfectly arranged in one’s imagination, and whatever needs to be fulfilled will be fulfilled. If there is a 100% negative karmic connection, then it is resolved positively on this occasion; in fact, it is resolved more than 100%. The sequence practiced in chöd is the same for specific chöd practices that are carried out to cure those who are physically or mentally ill, to pacify places that are negatively influenced, or to heal someone who is possessed by an evil spirit or something. Even though a special meditation session may be meant to serve a specific and different purpose, all practices are carried out according to the same principle and in the same sequence and manner. So, these are a few aspects of chöd I thought might benefit you. Thank you very much. Based upon the transcript formerly available on the website of Thrangu Rinpoche, edited & arranged by Gaby Hollmann in 2006. Photo of flowers taken & offered by Josef Kerklau. Copyright His Eminence Tai Situpa, 2009. All rights reserved.